The Grand Jubilee at Grand Country Music Hall is a popular show in Branson. 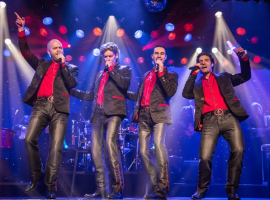 This show is unlike other shows in Branson because it is open year-round. The Grand Jubilee features New South Quartet, Jackie Brown, Mike Patrick, Jamie Haage, and the Grand Band. The Grand Jubilee showcases a variety of talent and all of the cast members have won numerous awards. New South Quartet features Mark, Luke, David, and Jon! Each quartet member is featured throughout the night in a variety of songs. Jackie Brown joins the quartet on a few songs, but performs her own to “wow” the crowd with her amazing voice. Mike Patrick emcees the show and makes sure comedian Jim Dandy (Jamie Haage) doesn’t interrupt anything. The Grand Band also gets to showcase their talent throughout the night as well. This show will have audience members begging for more. With so much talent, variety, and comedy, the Grand Jubilee is a show that guests must see when visiting Branson!